At this moment in history, we seem to be in a divorce-busting mode, relatively speaking, and so fewer therapists are likely to tacitly encourage divorce as many of us once did. This shift certainly has the weight of traditional morality behind it and probably isn’t likely to begin swinging the other way again any time soon. 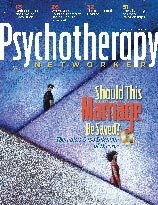 But this issue of the Networker features some intrepid authors who explore, with an unusual degree of transparency, how difficult it can be to determine what’s in the best interests of clients on the brink of making perhaps the most momentous decision for which therapists regularly have a front-row seat. It’s intended as a reminder of how powerfully we can influence the process, all too often without acknowledging it, even if we don’t have the deciding vote. When it comes to helping couples considering divorce, therapists have a hundred ways to ask “What’s right for you?” but often find themselves tongue-tied when it comes to asking “What’s right for the others in your life?” Is it possible to talk about interpersonal responsibility without shaming clients and driving them away? A therapist discovers what it means to be fully present, even in the face of the terrifying prospect of a declining mind. Personality and Habit Change: Are You an Upholder, Obliger, Questioner, or Rebel? Robert Putnam documents the myriad psychological, health, and political consequences of the ever-growing disparities between rich and poor in America today.